From hunger to disaster relief, international charity organizations exist to address the many causes that affect those around the world. There are several types of international charities that are dedicated to promoting peace, defending human rights, providing disaster relief and more. Each of these organizations has a specific mission that it is devoted to and strives to make a difference in the lives of those who need assistance the most. International charities serve an important purpose by reaching out to those who are in need of assistance in areas where there are little or no resources available. These charities provide aid either by educating, setting up programs or providing necessary supplies. Some international charities focus on one nation, while others may have a presence in numerous countries. Some organizations have a sole purpose such as to deliver medical supplies or to educate an underserved population, while others have a wider purpose of simply improving the lives of people living in the areas with the greatest need for assistance. There are many well-known international charitable organizations, including the four groups detailed below. Action Against Hunger / ACF-USA is an international humanitarian organization that focuses on combating hunger around the world. Its mission is to eliminate hunger through prevention, detection and treatment of malnutrition. The organization reaches out during natural disasters, war and situations of conflict to provide solutions that will put an end to global hunger. Action Against Hunger has over 30 years of experience and runs programs in over 40 countries that help over five million people yearly. World Vision is an international aid organization that is Christian in focus. It works to end injustice and poverty around the world by working closely with children and their families to identify what they need the most. World Vision works in over 100 countries and does not discriminate on religion race, gender or ethnicity. It helps communities find ways to improve their lives and find long lasting solutions to their many issues. World Vision's Gift Catalog is a way for people to donate to the organization and choose from gifts such as providing clean water to an impoverished village or to give a goat to a family in need. A person can make a donation and specify where they would like their money to be spent. World Medical Relief was established in 1953 to help the medically impoverished around the world. This international charity distributes medical, dental and laboratory supplies to areas where they are needed. Surplus supplies as well as monetary donations are what the organization relies on and uses these resources to make a difference globally as well as locally. Save the Children provides food, medical care, supplies and education to children in the United States and around the world. It responds to disasters as well as to long-term need in communities that have struggles that affect the lives of children. Areas of focus include hunger, poverty, illiteracy and disease. Areas where Save the Children helps include Africa, Asia, Latin America, Caribbean and the Middle East. There are several ways to find additional charitable organizations with an international focus. For example, visit Charity.org for a list of U.S. based international charities. UniversalGiving.org also provides a comprehensive listing of international relief organizations. Additionally, many of the groups listed with the American Institute of Philanthropy are international organizations. 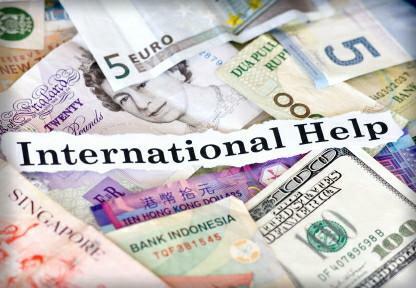 Most international organizations rely on donations to help fund their various programs. If there is an international cause that you hold dear, consider helping by donating either your time or money. Be cautious that in addition to the many worthy charities that there are ones set up as scams as well. Always check that a charity is legitimate before making a donation. Resources such as Charity Navigator list details about charities around the world and will give a rating that indicates validity as well as value.